Picking up Judy Gruen’s new book The Skeptic and the Rabbi: Falling in Love with Faith one Shabbat afternoon, I didn’t plan on reading for long. My whole Shabbat learning schedule was lined up ahead of me. But in the battle between the book and my willpower, the book won. Sometime around Havdalah, I got to the last page, with the forlorn sefarim looking at me from the coffee table. Reading Judy Gruen’s memoir feels like sitting down for a cup of coffee with a new friend. You trade stories, laugh at common experiences, share insights and think, where did the time go? Against the backdrop of the last few years’ crop in the Jewish bildungsroman genre, Gruen’s book, for once, feels relatable. The plot starts from the end with the excitement and nervousness of the author’s “Orthodox-style” wedding day, the last step sealing her connection to a Torah lifestyle. From there, she takes us back into the ‘60s and ‘70s, describing her liberal Jewish upbringing, as well as the shaping of her adult identity in the ‘80s, themes common to many other ba’al teshuvah stories. Yet Gruen’s childhood story is also different, molded by two sets of very different grandparents. The traditional Jewish learning and observance of Eastern Europe, brought over by her maternal parents, took on a melancholy and stressful streak in the new country, despite the fact that her grandfather was ordained in the Conservative movement. At the same time, her other set of grandparents cultivated a cosmopolitan, borderline anti-establishment mindset. The combination left Gruen yearning for a vibrant and joyful religious experience with plenty of breathing room, something she hadn’t seen as a child. Yet I walked away with two deep takeaways. The first was to stop being afraid to talk about God. Gruen’s meeting with her husband-to-be Jeff was the first step towards finding that kind of Judaism. Jeff had discovered Torah several years prior to meeting Judy, so by the time the two met they had to negotiate both their personal relationship and their relationship with Jewish observance. 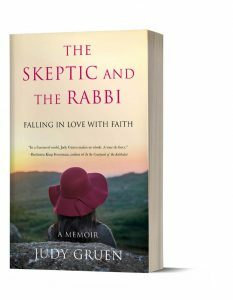 Though until then Gruen had practiced what she calls “cultural and emotional Judaism,” three main objections, almost stereotypes, emerge from the descriptions of her early encounters with religious observance: it is suffocating, it is anti-women and it is irrelevant. The last point was particularly poignant. When Gruen lost her older brother, Judaism as she knew it provided no solace. Years later she found herself wondering how years of Reform after-school education could have possibly left her with no concept of an immortal soul as a Jewish tenet of faith. Similarly, her attempts to question the temple rabbi about God did not provide a satisfying answer beyond a psychological experience. It took consistent, challenging, and honest, text-based Torah learning to change Gruen’s misconceptions. Together with her fiancé, she joined Rabbi Daniel Lapin’s classes, where she encountered not only the stories, but the multiple layers of meaning, the linguistic nuance and the philosophical questions as well. The learning led to the realization that there was much more that she didn’t know. The intellectual honesty prompted her to dig deeper. The same honesty shines throughout the book, as Gruen refuses to sugarcoat her narrative. She frankly discusses the many real challenges she encountered in her decision to take upon various mitzvot. As she explored the laws of taharat hamishpachah, for example, Gruen learned about the spiritual and marital benefits. Yet she also acknowledged the difficulties of keeping these halachot, especially at the outset. Similarly, the mixed bag of supportive, yet at times too-close-for-comfort shul life; negotiating a relationship with people at various levels of observance inside the community; and dealing with non-observant and non-Jewish friends and relatives is all in here, unadorned. The memoir is a terrific read for anyone curious about the Torah lifestyle. Yet I walked away with two deep takeaways. The first was to stop being afraid to talk about God. In Jewish discourse and polemic, inside and outside the frum community, we talk about religion, Torah, halachah and community, yet the mention of Hashem as the Creator and the Law-giver is all too often missing from the discussion. Ironically, even without knowing much about formal Judaism, many Jewish souls feel the presence of God almost instinctively and when they hear an authentic discussion of His presence, something clicks. This comes out clearly in Gruen’s story and has been echoed by the experiences I have heard from other baalei teshuvah. Years later she found herself wondering how years of Reform after-school education could have possibly left her with no concept of an immortal soul as a Jewish tenet of faith. Secondly, real, undiluted Torah study has the power to attract people and even break through misconceptions. The path to bringing more Jews closer starts with an unapologetic, yet empathetic, value stance. Though Gruen was privileged to encounter a charismatic and gifted teacher in Rabbi Lapin, it was the light of the Torah itself that shone through his authentic teaching, that enchanted her. Leah Aharoni is the founder of SHEvuk Business Consulting and the co-founder of Women for the Wall, a grassroots women’s organization dedicated to preserving the tradition at the Kotel. She lives in Israel with her husband and children. This article was featured in Jewish Action Spring 2018.